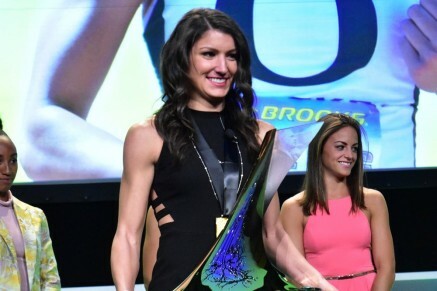 17th December 2015 – University of Oregon’s Jenna Prandini won the 2015 Bowerman Award for the best female student-athlete in American Collegiate T&F in 2015. The award, which is T&F’s equivalent of the more famous Heisman trophy, was presented by fellow PACE athlete and University of Oregon graduate Laura Roesler who won the award in 2014. Jenna’s 2015 season will go down in the record books as exceptional. She scored a combined total of 49 team points in the NCAA indoor and outdoor championships, winning individual titles indoors in the long jump and outdoors in the 100 meters. At the outdoor championships her 100m victory, second place finish in the 200m and second place finish in the long jump gave her 26 points while indoors her long jump win, second place finish in the 200m and fourth place in the 60m gave her 23 points. Jenna’s outdoor time in the 100m was the second fastest in collegiate history at 10.92 seconds and her outdoor 200 was fourth fastest at 22.21. Both are University of Oregon school records. Previous winners of The Bowerman include Galen Rupp and Jenny Barringer (2009), Ashton Eaton and Queen Harrison (2010), Ngoni Maskusha and Jessica Beard (2011), Cam Levins and Kimberlyn Duncan (2012), Derek Drouinand Brianna Rollins (2013), as well as Deon Lendore and Laura Roesler (2014).